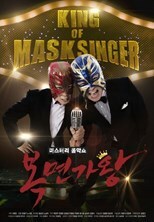 Mystery Music Show: King of Mask Singer (Hangul: ???? ??? ???? ; RR: Miseuteori Eumaksyo Bokmyeon-gawang) is a South Korean singing competition program presented by Kim Sung-joo, with introductions by voice actor Lee Won-joon (ko). It airs on MBC on Sunday at 16:50, starting from April 5, 2015 as a part of MBC’s Sunday Night programming block, along with Real Men, replacing Animals.